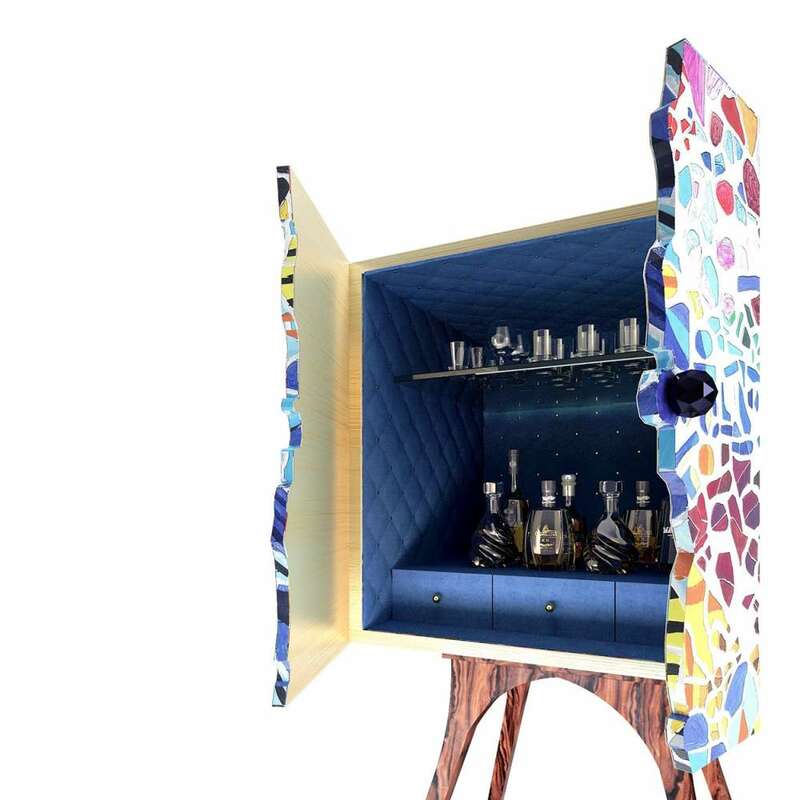 9 Cool Bar Carts & Cocktail Cabinets to Ring in the New Year! To follow last year’s Holiday post showcasing stunning drinks carts and bar cabinets, here’s a new crop of distinctive bar furniture that’s guaranteed to be a hit at your party! They run the gamut in style and vintage but there’s something for everyone. Which one(s) do you love? 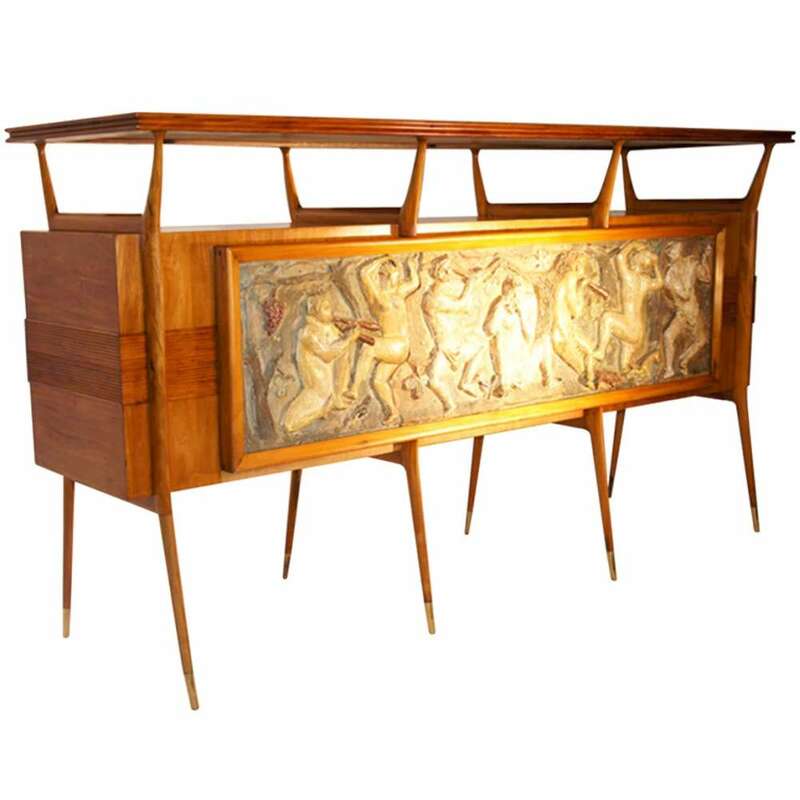 A divine mid-century inspired bar cabinet to channel your Mad Men sensibilities. The Alberto Cocktail bar is made from natural teak with an open pore satin finish that was popularized in the 60’s. 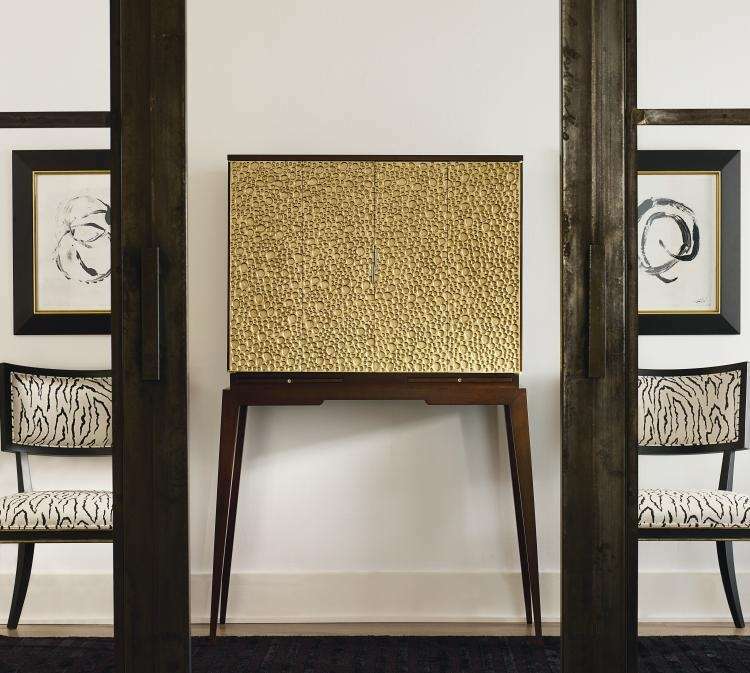 The ample, functional storage in addition to the colorful lacquer and antique mirrors prove this is not just a pretty face. As for the price, perfection starts at $22,000. 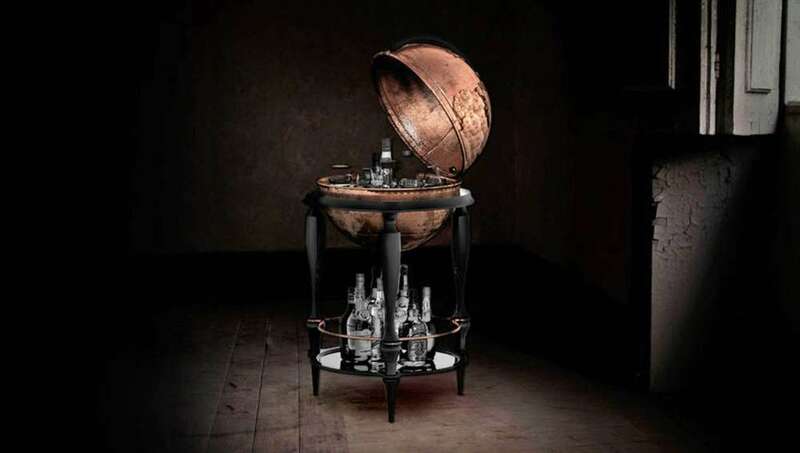 Looking for a drinks cart that befits an inveterate globe trotter? Check this out! The bespoke Equator Bar’s elegant lines and manually hammered polished copper orbs will be right at home in a gentleman’s drawing room (or a speakeasy). A statement piece hand crafted in Italy that does more than store your barware. While this contemporary cabinet provides ample space for glasses, wine and other accessories, it also features an LED illuminated display area in the center. I love the colorful contrast between the ebony veneer and polyurethane lacquer, but the combination of LEDs & mirrored interiors really brighten up the Monaco Bar Cabinet! 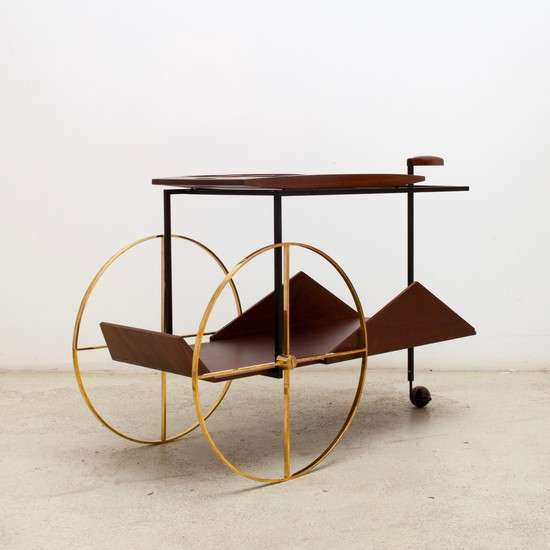 Vaguely resembling a bicycle, this very cool looking drinks trolley is a hot Modernist classic! Created by architect Jorge Zalszupin, the iconic JZ drinks cart’s striking brass wheels and triangular sided bottom shelf epitomizes Jorge’s hallmark of geometric lines and organic curves. Originally designed in the 1950’s, the design is equally sought after now. Current production uses woods that are Forest Stewardship Council certified, giving JZ green creds to boot. 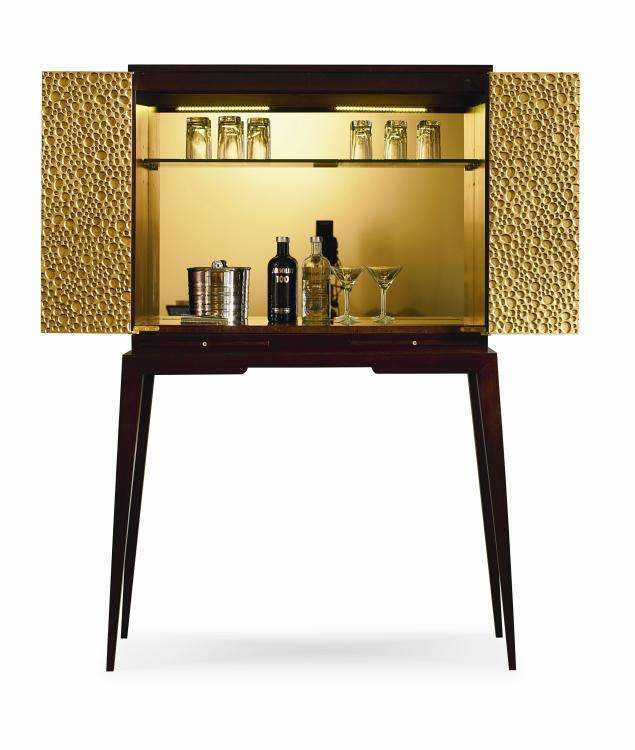 A highly sophisticated cocktail cabinet of simple lines and opulent texture. Aptly named Lunar, this bar cabinet is an amazing study in contrasts between the smooth daniella veneer and the highly textured composite bifold doors, reminiscent of lunar craters. A spacious well lit mirrored space, glass shelf and 2 sleek pull-out drawers allow any mixologist to work his or her magic at a party. 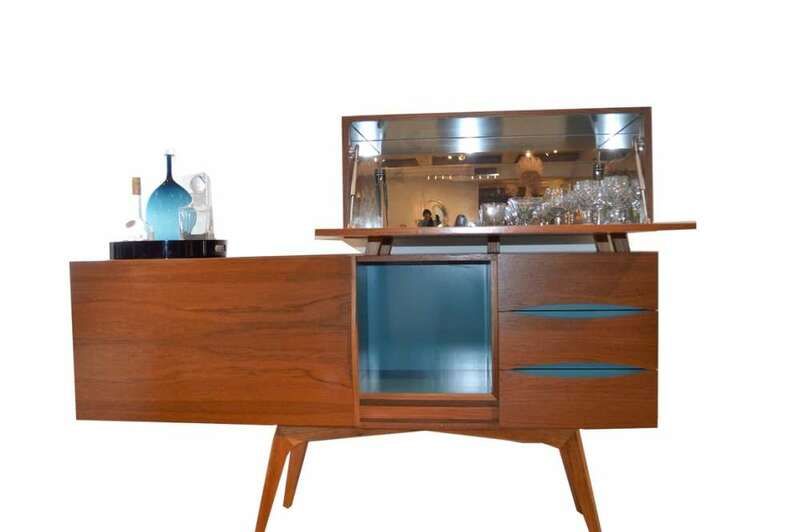 The quintessential mid-century drinks cart for the purists! 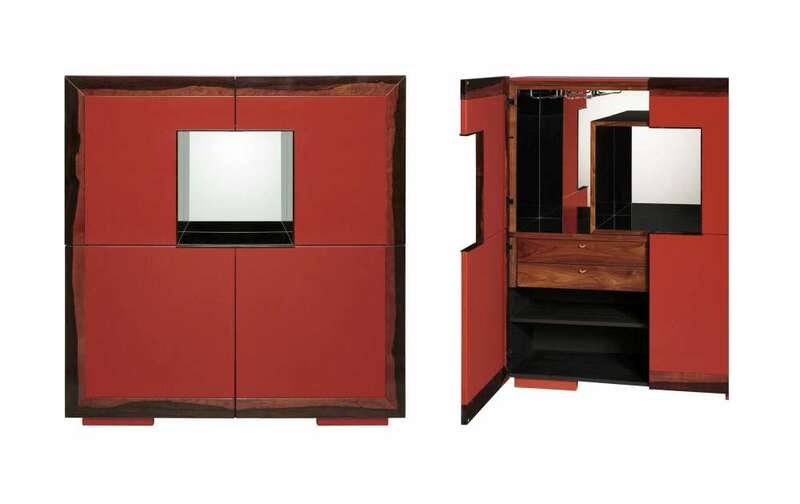 This bar trolley by Vladimir Kagan is being reissued by Ralph Pucci International. The walnut cart is topped with a pair of white formica lids that flip open to provide additional drink prep and serving areas. The neatly organized interior has room for an ice bucket, glassware and bottles. But if functionality does not win you over, the cart’s sensuous lines should! Purportedly inspired by celebrity architect Rem Koolhaas’ Casa da Musica and CCTV, this is an unabashed 3D extravaganza. 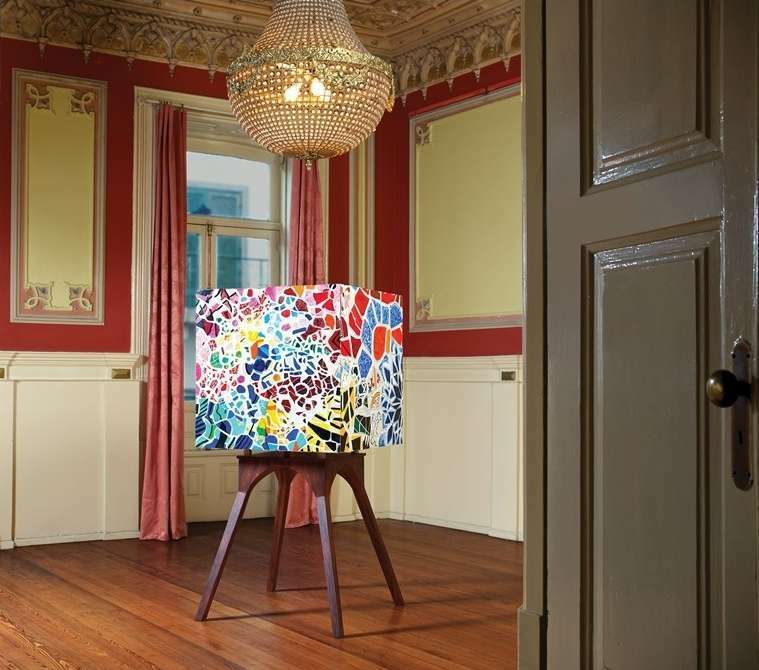 The profusely sculptural Cagliari cabinet resembles a cubist’s interpretation of a soccer ball rendered with a 3D printer. The exterior finish is mother of pearl style lacquer while the interior is lavishly bedecked in gold leaf and bronze beveled glass. The less exuberant base still shows plenty of action: The ironwood and caviuna wood are decorated with an irregular mesh of gold brass strips. All this engineering doesn’t come cheap, it costs over $15,000 for one of these babies. A Mid-century Modern rare find. This unusual bar of Brazilian caviuna was designed and made by Giuseppe Scapinelli between 1960-1969. Talking about wild parties: the cabinet was fronted by a ceramic panel that seemingly paid homage to a cluster of grapes amidst a bacchanal scene! View of bar cabinet’s interior finishes. The cabinet’s explosion of color and visual texture showed influence of the trencadís mosaic tile technique that was popularized by Catalan architect Antoni Gaudí. The exterior is hand painted to resemble broken ceramic tiles while the interior is richly emblazoned with gold leaf. This lovely masterpiece can be yours for only $12,000. Cheers! 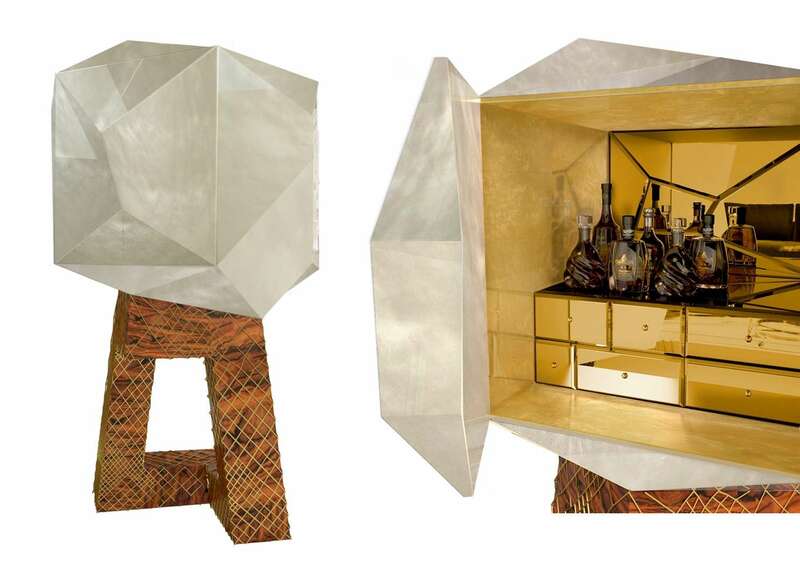 This entry was posted in Furniture, Interior Design and tagged Antoni Gaudi, Bar Cabinets, Drinks Cabinets, Drinks Trolley, Giuseppe Scapinelli, Jorge Zalszupin, Mid-century Modern, Rem Koolhaas, Trencadís, Vladimir Kagan by Marie Chan. Bookmark the permalink.